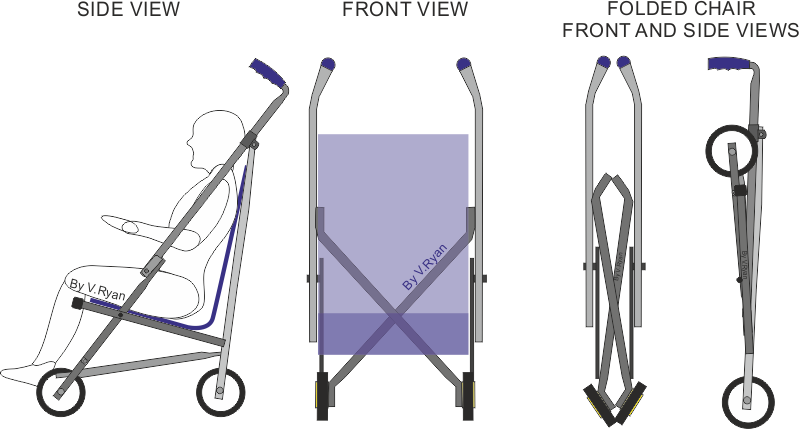 This is a simplified schematic drawing of a folding child’s buggy. An aluminium tube frame has been selected, due to the material’s strength to weight ratio. This means, that although aluminium is lightweight, it is also has the strength to perform as the main material of this product. Another advantage of aluminium is that is corrosion resistant, unlike steel which will rust, if not protected with paint (stainless steel does not rust but it is expensive and heavy compared to aluminium). It should be aesthetically pleasing (stylish and attractive). The buggy should have a simple folding mechanism. It should be lightweight and easy to carry and manouevre. It should be safe to use, for the child and the person folding the buggy. Fingers should not be trapped. It must not be possible for the child to fall out of the chair or for the chair to ‘topple’ over when in use. The buggy should be comfortable for the child to sit in. The handles should be ergonomically designed so that the user finds it easy to push and direct the buggy. It should be cost effective. The buggy should be easy to store. It must fold to a compact size. The buggy must look modern, stylish and sturdy/strong. It should be corrosion resistant. It should be possible to repair the buggy, when necessary. It should be possible to dismantle the buggy with relative ease, after a lifetime of use. All materials used in the manufacture of the buggy, should be completely recyclable (Closed Loop Recycling or Cradle to Cradle ® ). Using heavy materials, a complex folding mechanism, materials that corrode, a mechanism that could trap hands and fingers, poor manoeuvrability, difficult or impossible disassembly when being recycled, wheels detaching from the buggy when in use, poor ergonomic design, an expensive final product, an unattractive design.